Panjab University is starting a four-year self-financing course of Bachelor of Dental Sciences from the forthcoming academic session 2005-06. Offering 100 seats in all, the Dr Harvansh Singh Judge Institute of Dental Sciences would be set up in Sector 25 where the building has already come up. In a major fire, at least 11 cabins in a showroom on the first floor in Sector 22 here were reduced to ashes in the wee hours today. 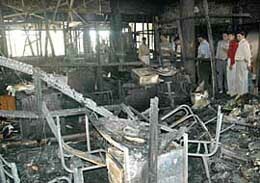 Fire department sources have estimated a loss of approximately Rs 15 lakh. The Centre for Research in Rural and Industrial Development, Chandigarh, in collaboration with a Hyderabad-based firm would undertake a project for watershed development in Ropar. Residents of the city are a peeved lot at the increased number of paid parking in the city from today onwards. Besides the existing paid parking in Sectors 8, 9 and 17 the city started the system in Sectors 22, 34 and 35 from today onwards. Residents of the city are facing shortage of water supply in different parts of the city, particularly in the belt of the southern sectors. The problem is very pronounced on the second and third floor quarters. Sameer Madan of Bhavan Vidyalaya topped the All-India Engineering Entrance Examination conducted by the CBSE in the city here today. He is placed eighth on the all-India merit lest. Mr S.P. Malhotra, a member of the committee formed to give suggestions on de-silting of the Sukhna Lake, said there was no need to spend Rs 80 crore on wet dredging at the lake. He suggested that the entire lake should be dried up in one go and a massive de-silting operation be launched. In violation of the Apex Court’s orders, banning the burning of leaves and other waste, the sanitation contractors in the township have found an easy way of disposing the garbage by burning it. The sanitation services in the township have failed to show any improvement. Though the amount spent on sanitation services has increased, the workforce and the services have decreased. Chandigarh: Earning for the family is a priority with Ravi Kant Yadav. His young shoulders have been burdened with the arduous task of fending for his family at the tender age of 15 years. Two cheques of Rs 35,000 each were given for the development works in schools of Kurdi and Gharuan villages by Mrs Lakhwinder Kaur Garcha, OSD to Capt Amarinder Singh, to the school heads and village panchayats. 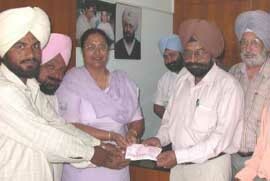 Mrs Lakhwinder Kaur Garcha, OSD to the Chief Minister Punjab, gives cheques to heads of schools and village panchayats in Mohali. The Municipal Council yesterday awarded a contract for rounding up of stray animals. The contractor will be paid at the rate of Rs 70 per animal rounded up by him. The residents of Abheypur village have decried the poor civic amenities in the village and sought the help of the Deputy Commissioner for the improvement of the village. 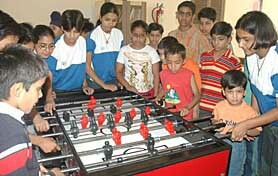 The Deputy Chief Minister, Punjab, Ms Rajinder Kaur Bhattal, today inaugurated the summer workshop for children and the table soccer sport at the Chandigarh Press Club here this morning. Ms Lakhvinder Kaur Garcha, officer on special duty to the Punjab Chief Minister and former general secretary of the Punjab Pradesh Congress Committee yesterday welcomed the re-election of Ms Sonia Gandhi as the president of the All India Congress Committee. The Army Educational Corps celebrated its 58th Raising Day at Western Command Headquarters, Chandimandir, here today. Employees of the ESPL staged a protest outside the factory here today against the alleged illegal retrenchment of workers by the management of the factory. This letter is an effort to bring to light various flaws in the examination system of MBA course offered by the University Business School, Chandigarh. The flaws became apparent to all during the financial management paper of the second semester examination. Owner of a Pinjore-based Hotel Batra died when the car he was driving had a head-on collision with a truck on the busy Kalka-Ambala highway near Saket Hospital in Chandimandir here this morning. The police today arrested a man, wanted in two cases of cheating for duping two banks. He was arrested from Hallo Majra village here. Kuldeep Singh of Sector 3, Panchkula, was caught breaking locks of the garage in a house in Modern Housing Complex in Mani Majra yesterday. An undertrial reportedly ran away from the custody of a Head Constable of Himachal Police from ISBT Sector 17. The matter came to light when the local police registered a case yesterday. A 30-year-old married woman today allegedly ended her life by hanging herself from a ceiling fan with a dupatta at her Sector 38-West residence. The reason behind the death is still not known, a police officer said. The police today raided a house in Lalru Mandi and found a spurious soft drinks manufacturing unit allegedly being operated by a local shopkeeper for the past couple of months. Thieves decamped with gold jewellery and other items from the house of a doctor working in the PGI, Chandigarh, in Phase IIIA here. An old man was killed and eight persons were injured when a bus and a tractor-trailer collided at the Kumbra chowk here late last night. The city’s changing profile as an emerging centre of education has not benefited much for women living in villages, if the literacy rate is any indication. In a gesture towards candidates appearing in CET-2005 examination being conducted by Punjab Technical University on June 3 at Chandigarh Engineering College, Landran, the college has decided to provide free transport facility to the candidates. Students of ITI, Phase V, here, went on a strike today following a call given by the All-India Democratic Students Organisation,. The students are protesting against the fee hike from Rs 3,450 to Rs 12,000 per month and the ongoing privatisation of the various ITIs in the state. 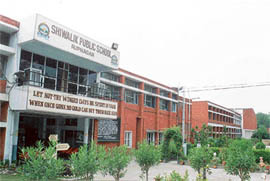 Shivalik Public School, Rupnagar, which is affiliated to the CBSE, is a reputed school of Punjab. The main objective of the school is to impart quality education to children and provide a curriculum designed for the physical, intellectual, cultural, emotional and moral development of the child so that be emerges as a responsible citizen of his motherland. The school strives to develop qualities of initiative and leadership in students so that they are best fitted to lead others and trained to fulfil their own dreams and the desires and aspirations of their parents. The Additional District and Sessions Judge, Ms Sneh Prashar, today held 12 persons guilty of murder, while discharging four others of the charges. His nimble fingers weave a magic of melody on tabla and spread happiness and harmony of rhythm all around despite the fact that life has not been a bed of roses for 22-year-old Ranbir Kumar. To draw the best bhangra dancers from Punjab, the Mason and Summers has introduced a month long talent hunt “Bhangre De Boss”. The platform will give an opportunity to artistes to display their skills and it will help in creating a best bhangra team. This was revealed at a press conference held at Press Club, Sector 27, here today. If what the Haryana Government is planning materialises, the North will soon have the first-of-its-kind holistic medical centre, with world-class facilities from different branches of medicine all under one roof, in the Mata Mansa Devi complex in Panchkula. To improve the sanitation services in the city, the Municipal Corporation today cancelled all existing sanitation contracts and made fresh allocation in all zones of the city. The PGI has decided to make the cash counters of the Advanced Paediatric Centre and the emergency block function round the clock from today. Medium pacer Sahib Malhotra (5 for 22) bowled St Stephen’s School, Sector 45, Chandigarh to an easy 126-run triumph over Little Flowers School, Panchkula in the ICL Certifications Inter-School Cricket Tournament for Under-15 being organized by Chandigarh Cricket Association affiliated to Haryana Cricket Association at the Satluj Public School ground here today. Local spikers Gurinder Singh and Balwinder Singh, both products of Shivalik Public School, Sector 41, and Lalit Kumar of SD Public School, Sector 32, who were part of the Indian Youth Volleybal team, have brought laurels to the city when they bagged bronze medal in the just concluded Asian Youth Volleyball Championships at Teheran on May 20. The Deputy Commissioner, Ropar, would be holding office in Mohali twice a week. Announcing this, the new Deputy Commissioner Mr H.I.S. Grewal today said he would be meeting Mohali residents every Wednesday and Friday.